Please click on the headings below to chose the section you wish to read. Click a meteorite name to be taken to its Meteoritical Bulletin Database page. Fell: 4:30pm, 4th August 1835. The fall consisted of a single 0.7kg stone and a shower of smaller stones. Detonations were heard and a fireball seen before the fall 0.5 miles from Aldsworth, Gloucestershire. 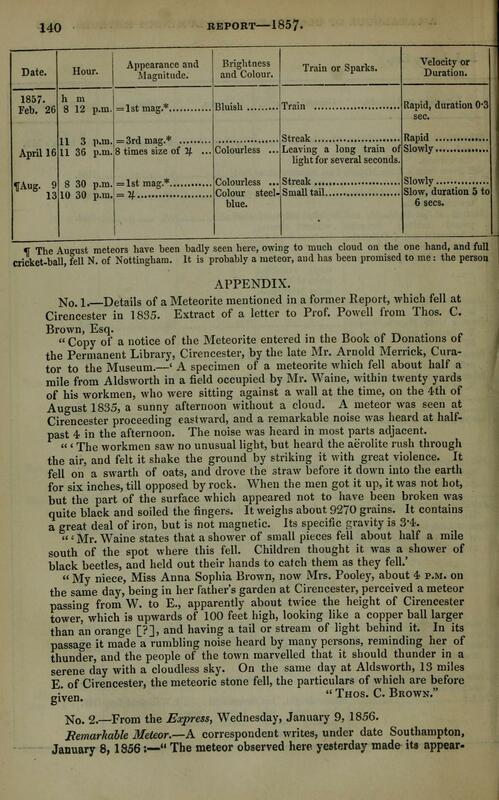 Details of a Meteorite mentioned in a former Report, which fell at Cirencester in 1835. Extract of a letter to Prof. Powell from Thos. C. Brown, Esq - Report of the British Association for the Advancement of Science for 1857 - Volume 27 (Local JPEG). Fell: 8:45pm, 13th October 1914. After a fireball and detonations, a stone of approximately 15kg was found at Halliwell Farm, Appley Bridge, Wigan, Lancashire. Note on the Appley Bridge aerolite of 1914 October 13 (T.R. Merton. 1914) - Monthly Notices of the Royal Astronomical Society, Vol. 75, December 1914 (Local PDF). Fell: 1:00pm, 9th March 1923. A stone of approximately 1300g was seen to fall at Ashdon, Saffron Walden, Essex. Note: Image source is unknown. Fell: 4:20pm, 24th December 1965. After a fireball and sonic effects a shower of stones fell in Leicestershire. Material was recovered over several weeks and totals at least 44kg. The first British meteorite 'find'. A single weathered stone, with a mass of 30g, was found by archaeologists excavating an iron-age site in Hampshire. Fell: 12:30pm, 5th May 1991. A single 767g stone was recovered from a garden in Glatton, Cambridgeshire, following the sound of rushing wind. Despite searches no further material was ever found. The Glatton Meteorite (J. Shanklin. 1991). Journal of the British Astronomical Association, vol.101, no.1 (Local PDF). A single mass of 17.6kg was found on a forest track by Rob Elliott, approximately 2km south of Hambleton, North Yorkshire. Image courtesy of Dave Harris. Fernlea Meteorites - Hambleton - Rob Elliott's page about the find. Hambleton - A New Sulphur Rich Pallasite (D. Johnson, R. Hutchinson, C. Kirk, M.M.G. Grady). Poster courtesy of Diane Johnson. Textural Evidence For Melt Processes On The Pallasite Parent Body (D. Johnson, R. Hutchinson, M.M. Grady) - A copy of the presentation slides used by Diane Johnson at the 69th Meeting of the Meteoritical Society (2006). Slides courtesy of Diane Johnson. Structure and Chemistry of Pre-Cursor Troilite in Pallasites (D. Johnson, M.M. Grady). Poster courtesy of Diane Johnson. X-Ray Microtomography of a Sulphide-Rich Pallasite (D. Johnson, I.A. Rahman, M.M. Grady). Poster courtesy of Diane Johnson. Implications of Sulphide Distribution in the Main Group Pallasites (D. Johnson, R. Hutchinson, M.M. Grady). Poster courtesy of Diane Johnson. Let There Be Rock - The Story Of The Hambleton Meteorite (Angus Self, 2006). From the Astronomical Society of Edinburgh Journal, No.50 November 2006. Fell: 5:00pm, 9th April 1628. At least three stones fell in Berkshire. Hatford (10.9kg), Challow (11.8kg) and Balking (6.3kg). Nothing has been preserved but it is clear from the descriptions of the time that this is a genuine meteorite. Fell: 7:30pm, 15th February 1830. After the appearence of a fireball accompanied by a triple detonation, a single 1.05kg stone was seen to fall. Fell: 3:35pm, 14th March 1881. After detonations a single 1.6kg stone was seen to fall at Pennyman's Siding on the railway about 1.75 miles from Middlesbrough. The Middlesbrough meteorite is a stunning example of orientation. Image courtesy of the Yorkshire Museum. Fell: 3:45pm, 20th April 1876. Type: Iron IIIAB Medium Octahedrite, Bandwidth 1.2mm. After detonations a 3.5kg mass was found in an 18 inch deep hole near Wellington, Shropshire. A mass of 10.4kg fell, it is described as "like a stone singed or half burnt for lime". None has been preserved. Fell: 3:30pm, 13th December 1795. After detonations a stone of approximately 25.4kg was seen to fall 0.75 miles from Wold Newton church, Wold Newton, Scarborough, Yorkshire. The Value of Publicity--The Wold Cottage Chondrite, Edward Topham, and the Foundation of Meteoritics (C.T. Pillinger, J.M Pillinger. 1996) - Meteoritics & Planetary Science, vol. 31, page A108 (Local PDF). Wold Cottage and Its Influence on Reports of the Pettiswood and Evora Meteorites (C.T. Pillinger, J.M Pillinger. 1998) - Meteoritics & Planetary Science, vol. 33, Supplement, p.3 (Local PDF). The Wold Cottage meteorite: Not just any ordinary chondrite (C.T. Pillinger, J.M Pillinger. 1996) - Meteoritics, vol. 31, pages 589-605. (Local PDF). British and Irish Meteorite Society (BIMS) - Fernlea Gallery, includes images and information on Aldsworth, Appley Bridge, Barwell, Glatton, Hambleton and Wold Cottage. Unless otherwise stated, information on this page was obtained from the Catalogue of Meteorites (5th Edition, Grady) and the Meteoritical Bulletin Database.